Leucoderma is also known as vitiligo in medical terms. It is a skin disease in which there is de-pigmentation of the skin. There is decrease in the production of the pigment called as melanin due to which there is discolouration of the skin. Discolouration may occur in small patches. Melanin is a skin pigment which is secreted by the cells present in the skin known as melanocytes. This pigment gives natural colour to the skin. Sometimes, this skin condition goes unnoticed due to presence of small patches on extremities. Slowly small patches may enlarge to form bigger patches. De-pigmentation of the skin may occur on any part of the body. There is no relation to age as it may also occur in children. There are patches of skin discoloration on different parts of the body that may expand to other parts of the time without taking any treatment. People having leucoderma may also suffer from premature greying of hair. Loss of hair may also occur in some individuals. Hair become white in patches. People suffering from leucoderma may have sensitivity towards cold. Mood swings are present. People having vitiligo may have episodes or anxiety and depression. People who suffer from chronic gastric disorders are prone to have white patches or leucoderma. Deficiency of calcium is another important cause of causing white patches on the skin. Other inflammatory skin conditions can produce leucoderma. People who remain under stress, worry and tension may also have low levels of hormones due to which they may suffer from skin discoloration. People suffering from chronic liver infections or worm infestations are likely to have leucoderma. People who wear tight clothes may have skin discoloration as proper oxygen does not reach to the cells of the body. People who use stickers or make tattoos on the skin can also have skin problems such as leucoderma. Low immunity due to poor nutrition can also produce discoloration of the skin. Performing physical exercise after eating heavy foods can also lead to the development of skin discoloration. Divya Kayakalp Vati: This is an excellent remedy for all skin problems. It makes your skin healthy by supplying the necessary nutrients. It is a useful remedy for people suffering from vitiligo. This helps by increasing the production of melanin pigment. This natural remedy stimulates the melanocytes to produce more melanin and to give natural colour to the skin. 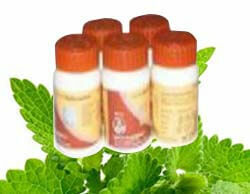 Divya Giloy Sat: This is also an herbal remedy useful for the treatment of leucoderma. It helps in producing the melanin pigment and provide natural colour to the skin. It boosts up the immunity and stimulates the melanocytes to produce sufficient amount of melanin to give normal colour to the white patches on skin. Divya Suddha Bavaci (Bakuchi) Churna: This herbal remedy is useful for gastrointestinal disorders. It helps by reducing the liver diseases and also by boosting up the immune system. It reduces the discoloration of the skin. Divya Svitraghna Lepa: This is an excellent herbal remedy for the treatment of vitiligo. This natural remedy provides nourishment to the skin cells and removes all the symptoms of vitiligo. It is a natural and herbal remedy and produces no side effects when it is taken regularly for the treatment of vitiligo. Prepare a mixture by adding one teaspoon of turmeric powder and two tea spoons of mustard oil. Apply this paste on the affected parts of the skin and leave for 10-15 minutes. Apply this paste two or three times in a day to get best results. Grind some walnuts into powder. Take two teaspoon of walnut powder and add some water to make a paste. Apply this paste on the white patches of the skin three to four times in a day. Leave it for 10-15 minutes and then wash off. Take goose fruit and take out its juice. Apply the juice of this fruit on the affected parts of the skin to get quick results. Take equal parts of red clay and ginger and mix them together. Apply it on the discoloured parts of the skin. Mix half glass of cucumber juice and half glass of alfalfa. Drink this everyday as it helps in boosting up the immunity. Take some dry pomegranate leaves and grind them to make a powder. Eat one teaspoon of this powder with water every morning. Basil leaves are also useful in the treatment of leucoderma. Take some basil leaves and make a paste by adding water and grinding them. Apply this paste on the skin to get effective results.